A Bay Area law student was the target of vandals last week, and police are investigating it as a possible hate crime. In what is being called an act of anti-Semitism at UC Hastings College of the Law in San Francisco, someone burned the mezuzah that was hanging on the door frame outside of a dorm unit inside what is known as The Tower, police said. A Jewish student who identified himself only as Jacob said he was the target. "It’s a lot more hurtful than they may have thought it was," he said. "After the numerous bomb threats we’ve received throughout the country, it wasn’t so surprising that it happened." Another student called campus police on Monday to report the crime that happened sometime during the school's spring break. Police are asking for the public's help in finding the vandals. 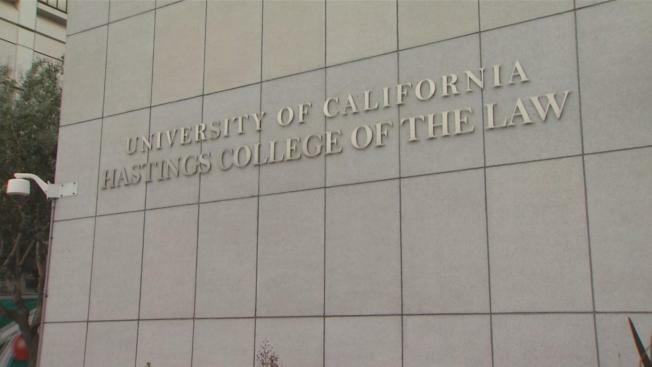 "It’s unfortunate, terrible and hurtful when something like this happens on our campus," said Alex Shapiro, director of External Relations at UC Hastings. On Wednesday, the university sent out a letter to students, calling the incident a cowardly act of anti-Semitism and urging anyone with information to come forward. "When an incident is reported like this, it’s something we all have to take a look at, make sure we figure out what happened and hold whoever is responsible responsible," Shapiro said. The building is accessible only to the students who live there or visit as guests, and on Wednesday, some students were disturbed to think one of their classmates could be involved. "Really sad that we’re not respecting everyone’s religious values, especially given what’s going on around the country," student Samatha Adhikari said. The university believes it is an isolated incident, saying there hasn't been any similar crimes reported. Jacob is hoping whoever is responsible realizes the pain they have caused. "It’s sad to see a rise in hate crimes," he said. "If you want to have a conversation, come talk to me. It's so cowardly to burn something and run away."